For over 40 years, FVB has planned and designed a wide range of district energy infrastructure in Europe, North America, Middle East and beyond. Our engineering expertise is firmly rooted in the real world; moving beyond feasibility studies and conceptual designs, FVB has served as detailed design engineer, construction manager, commissioning engineer on many projects, as well as providing management consulting services to operating district energy systems to improve operating results and customer service. Because of FVB’s extensive district energy experience, we can move quickly to identify reliable and cost-effective technologies for meeting energy requirements in the study area. Further, our engineering work is informed by our understanding of the business implications of design decisions. For new district heating systems, it is clear that, when it comes to the bedrock purpose of district heating — space heating and domestic hot water – hot water distribution (rather than steam) facilitates more opportunities for GHG reduction. 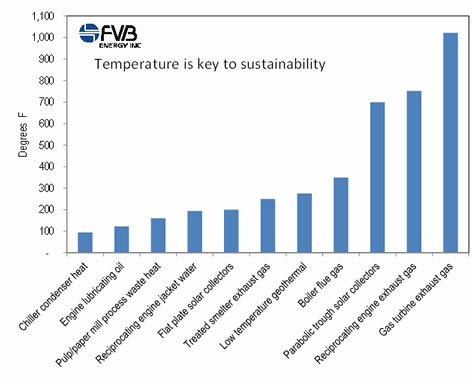 This stems from the fundamental fact that the temperatures required to meeting these end-use needs are relatively low, and there are more renewable and waste heat resources available at low temperatures (see Figure 2). In addition, in many combined heat and power (CHP) technologies the output of power is higher if the temperature of recovered heat is lower. Hot water generally has lower distribution losses and can be transmitted over longer distances, saving energy as well as facilitating use of industrial or power plant waste heat by making it potentially feasible to tap those resources from more than a few miles away. Hot water can also be stored, providing flexibility that can save money and enhance the ability to capture low-carbon energy. FVB approaches system design with a focus on the fact that there are numerous opportunities for optimization by looking at district energy systems as an integrated whole. We start first with the buildings, seeking to reduce building loads to an economically optimal level. We then look at the potential local energy sources, with a focus on the quantity and quality (temperature) of those sources. Only then can we design an optimal integrated system of thermal production, distribution and utilization within the buildings. There are economic trade-offs to be considered. For example, accessing lower-temperature heat sources will tend to drive up distribution costs because the size of the pipes increases with lower “delta T” (temperature difference between supply and return water). Delta T can be increased in the buildings through appropriate design and equipment, but this can drive up building costs. Based on its extensive experience, FVB is skilled at evaluating the economic trade-offs between building, distribution and production designs.